Shades of white: some dye tests on white oak. One of the 2018 trends for the kitchen is without a doubt the return of the oak for the cupboards! For oak or any other type of wood, a dying technique is preferred for the application of color. This second article in this series will introduce you to our process of dying. Check out our previous article to learn more about lacquer and wait for our next article for the unveiling of our 2018 color palettes! The finishing of kitchen cabinets with dyeing is a technique by which a layer of dye and/or varnish is applied to cover the wood panels. 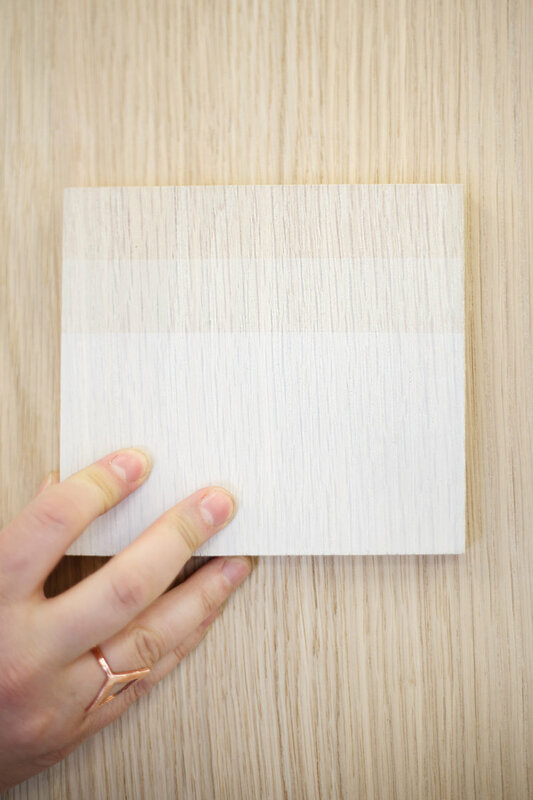 The latter can offer a transparent or opaque finish while leaving the wood grain visible. The variety of nuances is vast: light or natural hues featuring the richness of wood species with deeper hues such as black. Applying a lacquer (a varnish) to seal the dye and protect the surface. The preparation; the most important and laborious step of this process. Unlike the application of lacquer or the majority of time is concentrated on the application of multiple layers of paint alternately with light sanding, the preparation of the material for dyeing is the most time-consuming step; it requires almost 80% of the working time. 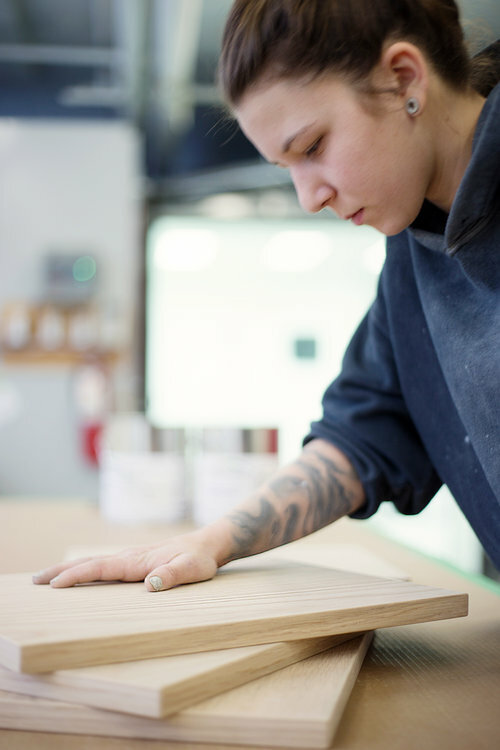 Good preparation of the material is essential to obtain a dye that enhances the wood without diminishing its brightness. For a clear finish (without any coloring), two layers of sealant are applied following the preparation of the material. White oak, ash, and red oak are the most commonly used materials for dyeing. These wood species with a deep grain are all indicated to achieve the desired effect! Games of transparency and opacity: the grain of wood is always highlighted! TIP: IF YOU GO FOR WOODEN CABINETS, MAKE SURE THE MANUFACTURER USES 3 SIDES OF PLATING FOR THE SIDES OF ITS FACADES, YOU WILL BE ENSURED FOR INCREASED RIGIDITY AND LIFETIME FOR YOUR KITCHEN. 3 PLATES = 1/16 "INCHES VS 1 PLATE = 1/42" INCHES. And do not forget to read our next and last article in this series for the grand unveiling of the Cuisines Steam 2018 color palettes, we can not wait to share it with you!